The Iraqi monarchy was abolished by the then-ruling Republican regime on 14 July 1958 by Abd al-Karim Qasim in a coup d'état. The current pretender to the defunct throne of Iraq and Syria is Prince Ra'ad bin Zeid. According to Articles 19 and 20 to the 1925 Constitution: The sovereignty of the constitutional Kingdom of Iraq resides in the people. It is a trust confided by them to King Faisal I, son of Hussein, and to his heirs after him. The Heir Apparent shall be the eldest son of the King, in direct line, in accordance with the provisions of the law of succession. The Constitution was amended in 1943 with Article 19 remaining the same and Article 20 stating; The Heir Apparent shall be the eldest son of the King, in direct line, in accordance with the provisions of the law of succession. If there was no Heir Apparent according to the line of succession, the ablest adult male Iraqi of the eldest sons of the King Hussein bin Ali shall be heir until there is an Heir Apparent. Females were excluded from the line of succession. ^ Hall, Daniel. 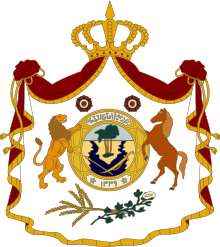 "The Royal House of Iraq: Genealogy". The Royal Ark. Retrieved 28 July 2016. This page was last edited on 5 April 2019, at 13:06 (UTC).